What’s scarier than a vampire or a ghost? But with a little planning and thought, you can make sure the only frightening aspects of Halloween are the people dressed as clowns and Elmo. Bring a flashlight. The sun sets at 6:26 p.m. in Detroit this year on Halloween. A good flashlight will let you see each other, cracks or bumps in the sidewalk as well as any other hazards. Lots of people use their phones flashlights, but they really do drain the battery, so we recommend a good old-fashioned low-tech flashlight. And for the nerdy/safety-conscious combo, we love miner’s lamps. Reflective clothing. Light colored costumes are awesome. But for witches, vampires and Batman, the costumes are typically all-dark. Have no fear; all it takes is some reflective tape placed on the back. You can also purchase reflective armbands, especially sold with bicycle supplies. Remember those light up shoes? This is a great night to wear them! Mask management. Sometimes, the mask really does make the costume. But masks that obscure vision are really dangerous for everybody, especially small children. Try to do face painting instead. If the mask is non-negotiable, maybe just let the child wear it before approaching the house and lift it up as you walk between houses. Luke Skywalker needs his light saber. Dorothy needs Toto in a basket. Consider your child’s balance and the trail you’re traversing. With their candy bag in one hand, they will have no hands free. We know of overly laden children who have simply face planted on Halloween as they weren’t able to break their falls. Examine your child’s treats before they are allowed to eat them. This is especially true for children with allergies. But, obviously, all treats should look clean and unopened. If you’re giving out candy, be sure your outside light is on and provides maximum illumination. If you don’t want to participate in giving out treats, simply turn your light off. Be sure the path to your door is well-lit and free of obstacles and debris. Decorations should be visible but not impede progress of kids. 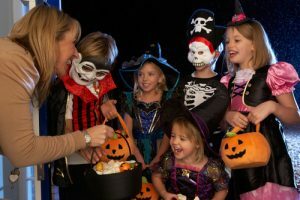 If you have stairs to your front door, you might want to stand outside and descend to give out treats to limit kids’ exposure to your steps (and your exposure to their falls). Be a good host and give out sealed, small treats. If you know you have neighbors with food allergies, consider distributing little stickers or temporary tattoos or other non-food treats. Everybody likes those and parents approve, too. Keep dogs inside, but they can be visible. Unless your dogs can handle a crowd, don’t bring them outside to be petted. Be sure your dog doesn’t have access to the candy as chocolate is extremely lethal for dogs. Halloween is a great time to connect with neighbors and celebrate Fall. Let’s be safe out there!